Over the course of 2018, ACS has continued to offer a wide range of educational bursaries to students from arts universities throughout the UK in addition to our ongoing commitment to supporting cultural charities and arts prizes. ACS is proud of its status as a not-for-profit Community Interest Company. As we operate solely for the benefit of our member artists, any surplus income is used for the benefit of our members and the wider artistic community. Since ACS was established in 2006, this commitment to the arts has assisted in supporting a great variety of community projects and charities. We are delighted to have been able to provide £30,000 in educational bursaries and prizes to students from UK arts universities in 2018. Our existing relationships with institutions such as Falmouth University and Loughborough University were renewed this year with undergraduate materials prizes to help students purchase art supplies. 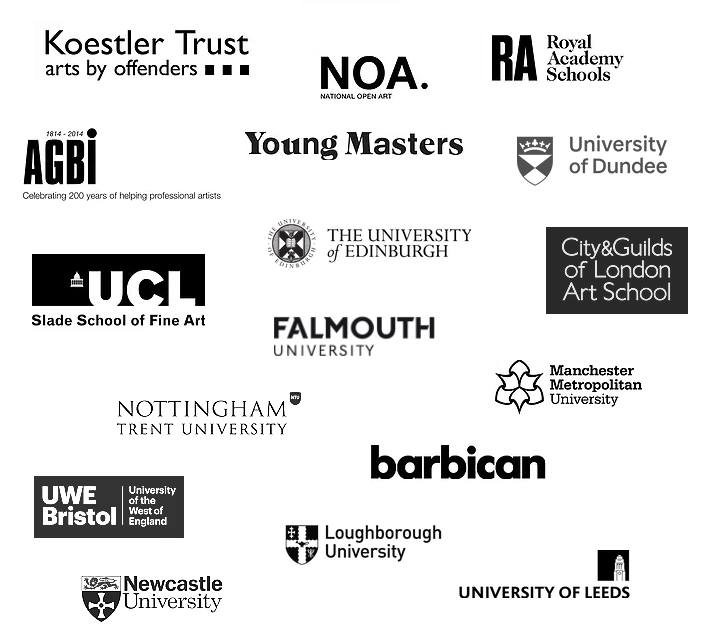 Our postgraduate bursaries at the Slade School of Fine Art (UCL) and the Royal Academy Schools, which help support students at Masters level, were also reintroduced this year. We have continued to work with the City & Guilds of London Art School to offer one undergraduate student a £1,000 prize to assist with materials, and one postgraduate student a £6,000 prize to help secure studio space in London as they transition from student to practising artist. This year, artist Natanya Barrett was awarded the year-long Studio Residency. Our work with the University of Edinburgh and Wasps (Workshop & Artists Studio Provision Scotland) has also extended into 2018, providing one £3,500 prize and a dedicated studio space for one year to assist a graduating student at the onset of their career. Multimedia artist Sophia Pauley was the recipient of this Studio Award in 2018. In addition to renewing existing prizes and bursaries, in 2018 we have partnered with more institutions than ever to ensure that students and emerging artists throughout the UK are supported. We are thrilled to announce that this year a range of new prizes at Manchester Metropolitan University, Nottingham Trent University, Newcastle University, the University of Dundee, the University of Leeds and the University of the West of England, Bristol were introduced to assist students with the cost of materials as they transition to their final year of studies. The ACS Studio Prize was also reintroduced in 2018 to offer one recent graduate a £6,000 prize to help acquire their own studio in a UK city of their choice. Five finalists were chosen from a national open competition which attracted 330 submissions, marking a huge increase in applications from the inaugural Prize in 2017. Judges Lady Bridgeman, Eileen Cooper RA and Rob & Nick Carter awarded this year’s ACS Studio Prize to painter Rebecca Harper. Congratulations to all prize winners and bursary recipients! We will be featuring interviews in our Student Spotlight series over the next few months – be sure to catch up here with interviews with our last cohort of prize winners from 2017.